Does Dogs drink water by licking, What You think? Check this video which is filmed using a Phantom camera at 1000 fps (frames per second). The footage is taken from a series called "Secret Life of Dogs". 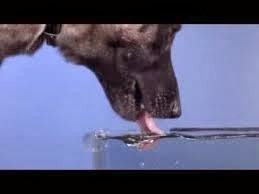 Here you can see, dog put its tongue into the water and fold it to form a cup shape, fetching water and drinking it. ie, "Nadukadalil chennalum naaya nakkiye kudikku"
"നാടുകാടലില്‍ ചെന്നാലും നായ നക്കിയെ കുടിക്കൂ"
"Even if you take a dog to the middle of the ocean, it will only lap water, not drink it."